Andrew Kim turned a lot of heads last year with a bold redesign of Microsoft's corporate branding, a vision and set of logos far braver (and classier) than what Microsoft eventually came up with for products like Windows 8 and Surface. It was all unofficial "fan" work, of course, but things just got a little more serious because Kim has been hired by Microsoft. 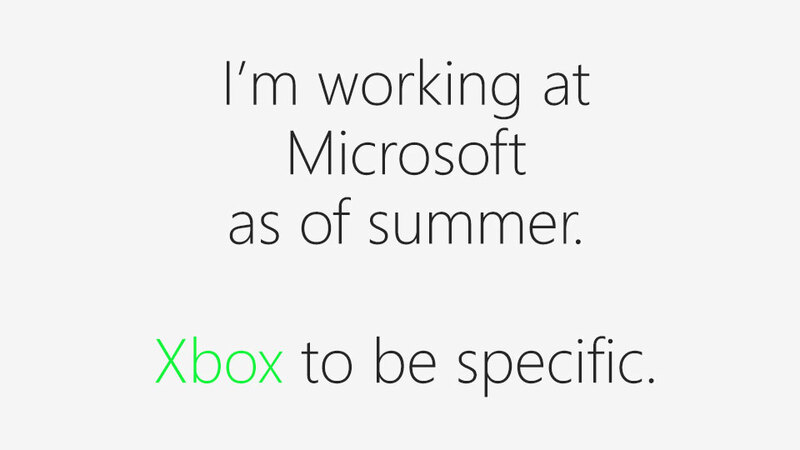 To work with the Xbox team. Saying that he's about to "work at a place I can really get excited about", he starts in the Summer. While he's (presumably) too late to have shaped the design of the next Xbox, here's hoping it's still a step by Microsoft towards fixing the Xbox brand's...brand. That circular X logo just isn't cutting it anymore. designers man... I'll never understand how someone can draw a skewed rectangle then say to a multi-billion dollar company "this shape now represents you and your product." Dont get me wrong, I am mad jealous of this guy's talent. to distill down an image of a global company into a simple four sided shape and to make it work takes vision & talent. and to get a company to agree to it takes a bucket-load of conviction. seriously though, good on him. I think its a shame his Windows designs werent picked up & I'll be interested to see if he has any impact on the xbox marketing designs. I was a graphic designer and my wife still is. Please don't make statements that show your ignorance. While the final product may appear simple and like something 'anyone could think of', the amount of ideas, brainstorming and refinement that went into those logos would have taken an amount of time that would surprise you. Because he would have gone through that process, he would have no problem explaining how he came to those final products. We don't just sit down at the computer and go "Hm...Microsoft's new logo should be a skewed rectangle, now how could I spoin some crap to make Microsoft accept that this should be their new logo?" see the bit in particular that says that it takes talent & vision to do. I DID read past the first sentence. The sentiment of the rest of your post doesn't indicate otherwise. The basis of your post still basically insinuates that had this been the design Microsoft went with, this guy would have 'duped' them into taking it. The fact you mention his obvious talent is irrelevant. "to distill down an image of a global company into a simple four sided shape and to make it work takes vision & talent." This is only a sentence or two after your first one. You've still over simplified everything. But either way, it makes no difference. Microsoft did the right thing giving this kid a job. Because regardless of one's opinion on his output here, I'd argue one of the main reasons Microsoft hired him is his drive. To go to this much effort off your own bat without expectation of reward is amazing. He made it pretty clear that he thought it was more than just a skewed rectangle thing. Also it IS just a skewed rectangle thing that could have been designed by a particularly slow 6 year-old. Just because hours of “ideas, brainstorming and refinement” goes into something doesn’t mean that the end product is anything more than a four sided shape. I really think a lot of it does come up to spinning crap to the company that it should be their new logo. "The New Microsoft" was a three-day project that Kim set himself. It's literally the first sentence of that blog post. Although, you're not wrong: I was surprised at the quality, depth and detail in the end result given the three day timespan. You might have been a graphics designer but surely you are not a good reader! I don't know what it is about Graphic Design that makes people think they can completely second guess everything that is output. You don't second guess a gardener when he mows your lawn. You don't second guess a pilot when he flies your plane. You don't accuse a contractor of putting no effort into constructing a building and just finding someone gullible enough to live in it. The best people in their field always make their work look easy, that's why they're the best. And while this guy isn't the best in his field, an outsider looking in can scoff and claim they could do it better, or that it took no time to complete, but these people just look like idiots to everyone around them who knows better. This project took 3 days, and 3 - 6 years of tertiary education, as well as who knows how many years of freelance and studio experience on top of that. Obviously yes, that guy misread what was being said in your comment, but all the follow up comments sort of illustrate that opinion very much exists regardless. You (collectively, not necessarily "you" the person I'm replying to) second guess game developers all the time though. And film makers, musicians, artists. Anything creative will attract people without skills in that particular field who'll offer their own critique. Anything consumable too, really. And there's isn't anything wrong with that. If you put yourself out there, then you need to be able to take the criticism, even from those people who clearly have no idea what they're talking about (in games you get that a hell of a lot, from media as much as the average consumers). Graphic design is a tougher thing to quantify than most forms of art because you are simplifying an extremely complex entity, whatever it might be, down to a simple form, whether it be a logo, package, website or whatever else. As such you're going to pull in more people asking yo what the hell you're doing and telling you how it should have been done better. And on that note, from my own perspective as a game artist, I don't think the parallelogram is a good logo. There is nothing for the average punter to latch on to that'll lead them to an understanding of what the product or company is. It's also not at all distinct. It's too simplified to stand out in a crowd of other logos and could easily be glanced over entirely when appearing on a package, pamphlet or what have you. As a design exercise it was probably quite valuable to the artist. As a logo, I think it fails on a lot of levels. Yeah definitely, while I'm talking specifically about Graphic Design, my argument is true for all creative fields. I just feel that something like concept artists or illustrative artists sort of 'get away' with avoiding this sort of criticism because when their work is done, it usually looks very flashy or obviously impressive. Every person has tried to draw at least once in their life and most have failed. They understand that it's difficult and drawings usually look either 'wrong' or 'right'. There's far less grey area. Not many have tried to design a logo or a corporate identity in their life and as such have no real comparison of failure to judge it against. I agree on that last point. Especially when appropriated for that Microsoft Office logo. That looks terrible. The shapes have just been overlaid not in any meaningful way, it looks messy and cheap. I do quite like the simplicity of the main logo though. I think it's one of those things that would look very sharp once it was used on packaging and amongst other assets. On its own, it's harder to tell. It amuses me that the designs are strikingly similar to Apple's marketing designs. I don't blame Microsoft wanting to put some modern enterprise into the Xbox's design, shedding the past is a great way to avoid stagnancy it should be interesting to see where this goes. It will be interesting to see what Microsoft does with the design of its controllers for the next Xbox. IMO the current design is just about perfect and I wouldn’t expect that Sony will be looking to do anything interesting with its next controller after the “batterang” debacle when they announced the PS3. I definitely think they've already borrowed some of his ideas - check out the logo for Office 2013. The application themes themselves are absolute shite, which he had obviously nothing to do with. You have 3 choices - white, light grey and dark grey. Yeah, I'm really not a fan of this minimalist / monochromatic binge Microsoft is going on at the moment. 16 Million colours to choose from and MS give us 3.